Welcome to the 2018-2019 Rotary year where our theme is “Be The Inspiration!” This year we are very lucky to have the District Governor for District 5910 to be one of our members – John Hathaway. Additionally, we are very lucky that John has outlined a plan of action for the District that is so closely aligned with our own interests. John has nicknamed this plan, “Three Peas in a Pod.” The Peas are Participate, Polio and Peace, the Pod is Publicize. Participate: Rotary is full of options to participate in service opportunities or fellowship events. Check our website for upcoming events! 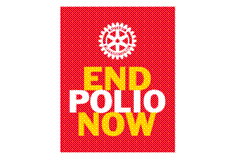 Polio: This year we are proud to be participating in a fundraising campaign to generate $167,000 which through matching by the Bill and Linda Gates Foundation will total $1 million for polio eradication. Peace: We will support world peace by attending and volunteering at the Peace Conference in Houston February 8th -10th. Publicize: We are working to improve our outreach efforts such as with this monthly newsletter! In addition to participating in John's “Three Peas in a Pod” plan, we will also be focused on improving our infrastructure and creating new service opportunities, such as with the addition of Rotary House. We will also be streamlining our organization via job descriptions for each Committee. I hope you are excited about this year. I know I am! I look forward to seeing you at our next weekly luncheon! We are pleased to announce that our apartments are fully occupied with a waiting List. Over the last four months we have been 80% occupied. We are extremely excited to see so much interest in such a short of time. To date, we have provided 204 days of lodging to patients undergoing extended treatment and their families at our Medical Center, This represents over $30,000 in direct benefits to these patients and families. Our patients have included 9 infants and children plus two adult cancer patients. These patients have come from as far away as St Augustine, Fla. and as near as Huntsville, Texas. We are currently evaluating our funding strategy to see if we can add a third apartment. What do you think? The Hospitality Committee could use more people to check in on our families and make sure they get the support they need to continue caring for their babies. If you are interested in help and/or have an idea, contact Jon Sanderson at jon.sanderson@primelending.com. It's that time again! The YMCA is hosting another fun packed event located at Northshore Park. The Dragon Boat event will also include other activities you can participate in. So, come out and join us Saturday morning for 4 hours, September 29th at 8AM. It will be a lot of fun!Bring your family and invite a friend. Thank you to the ones that have already signed up. If you have not, please send me a response with your name and shirt size. We need to fill up our roster! Look forward to seeing everyone there! 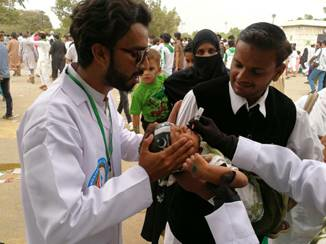 Polio Eradication--We Still Have Work To Do! PolioPlus: Zero Is The Magic Number! The members of the CCVA board are very enthusiastic about this year's Fall Festival and I believe the Interact members will enjoy it even more than in the past.